I'm planning a rummage through several boxes old family photos as I'm sure there are some in there showing dad on one of his bikes wearing surplus Irvin, '41 flying boots, gauntlets etc. There some of other family members and friends who all bought most of their gear cheap in the local surplus stores. I've been prompted to do this after seeing a few photos that were recently posted up on one of the local interest groups. I saved the photos at the time but can no longer find the source and unfortunately failed to save details of the person who submitted them. Apologies for that. I do know they originate from somewhere in East Anglia, UK. Dany McDonald, dujardin, Flightengineer and 4 others like this. Love the photos! The surplus store is a dying breed here in the States, but there are still good deals to be had. Tommy, Dany McDonald, dujardin and 6 others like this. I love these photos of WWII flying clobber being used in and around cars and bikes in the years after the war. 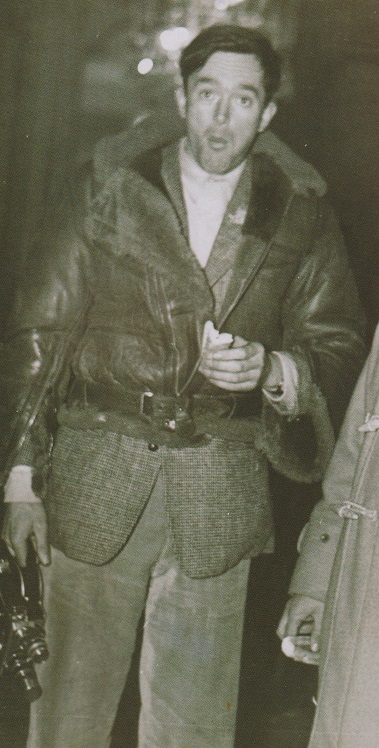 I have a rather good photo of Australian Spitfire ace and later motor racing driver, Tony Gaze at the 1953 Monte Carlo wearing his old Irvin over his tweed jacket. I'll dig it out and scan it as it's a cracking photo. Micawber and dinomartino1 like this. Stores here in the US who sell that type of surplus gear have slowly faded away and are now few and far in between. However, what I don’t get is the reluctance of some to purchase currently or recently issued military jackets and gear at next to nothing prices. Certainly these will be some of the.jackets being discussed 15 or 20 years from now . Will those of us still around then be saying things like, “I remember the days when those jackets were all over the place and you could buy one for the price of lunch money” or will some of us have the insight to buy a few now and hang in to them for when that time comes. raulm1961, Micawber and dinomartino1 like this. Here's a pic of an original unissued Aero 21996 that was bought at a surplus store, [from the guy I got it from}. As close to brand new issued that you could possibly get. and not from wear. It was near mint! Dany McDonald, dujardin, Pilot and 10 others like this. That’s one super nice jacket. Turning it loose must have caused a little more than a few “let me think about this” thoughts. I can remember when surplus stores actually had military surplus clothing in them. These days they seem to have turned into camping shops. I still have stuff I bought in surplus shops as a teenager in the 80’s, like my Luftwaffe leather gloves. I never saw any flight jackets for sale though. A chap I used to work with told me about the original Irvin and A-2 that he bought in charity shops in the 60’s-neither of which he kept. I know he paid £25 for the Irvin, which was quite a lot then. Smithy and Micawber like this. Not really. JC was making an A-2 for me which took away any sadness, whatsoever. Besides, I'm not a vintage collector but Andrew is. And I know it will be well appreciated and taken care of. You know... I have a few great pics of me wearing it on a hard drive I have to get downloaded at some point. Seems enough to me to have the memory and the pics. Chevalier, Smithy, Micawber and 1 other person like this. That’s a great attitude and pretty thoughtful of you as well . Here you go. Sorry it's not the greatest of scans but it'll do the trick. Here's Tony at the '53 Monte wearing his old issued Irvin and tucking into a sandwich. dujardin, dinomartino1, falcon_ib and 5 others like this. That third pic of Micawbers reminds me of my Dad, he had a 58 Triumph T'bird and during winter months rode it wearing a former tank suit similar to the one in that pic, it had all the heating wires still intact etc, bought from a local surplus store. For anyone living in London there's a surplus store in Waterloo opposite the Young Vic theatre that when you look n the window it looks as if it's been there donkeys years. Personally never been in as always on a mission but noticed some aviator sunnies last time. Out of curosity maybe I should check it out! Bought my first ever Levis from a surplus store as back in the day they weren't so easy to come by!! There used to be a seedy place somewhere along the Old Kent Road that advertised in the Exchange & Mart. I bought loads of stuff from them back in the 60's to early 70's. Never paying more than a few quid for anything I remember some bits needed a bit of fumigating before I felt the desire to get to close lol. There were some real bargains though. Thanks Grant for posting that. He was a fascinating chap and lived a very exciting life. His biography "Almost Unknown" by Stewart Wilson is a superb read, real Boy's Own stuff and I'd recommend it to anyone here who enjoys fighter pilot (and in this case motor racing as well) memoirs. Anyone seen the obviously promoted Alpha Industries You Tube shorts on US surplus stores? There's Kaufmans in NYC, Ady &Macs (?) in Portland, Oregon and one in LA the name of which eludes me. Quite interesting although clearly they home in on Alpha stuff but as one guy says ' there's a scarcity of WWII gear now' - it is 2019 after all! You know there is much to be said for this approach. While quantities of surplus material are not approaching that of the 60's-70's I think there is sufficient scope to stockpile modest amounts especially if the stuff is can be identified as the type in use in such and such a conflict or action. of course a lot depends on whether you have the space and facilities to keep it in good condition for an extended period. Huge businesses started by guys initially flogging a few modest bits and bobs that they picked up off the back of a lorry or at surplus auction. Of course these days in the UK the disposal programmes are handled by a few contractors who themselves want a very healthy slice of the proceeds. Take Withams as an example. Was finally able to extract these pics from Photobucket. Unbelievably time consuming. This is the same 21996 pictured earlier in this thread. Near mint! Plus a few wearing pics, so you can see the drape of a new wartime Aero A-2. Again, this is now owned by Andrew Swatland. jack31916, Smithy, falcon_ib and 2 others like this.